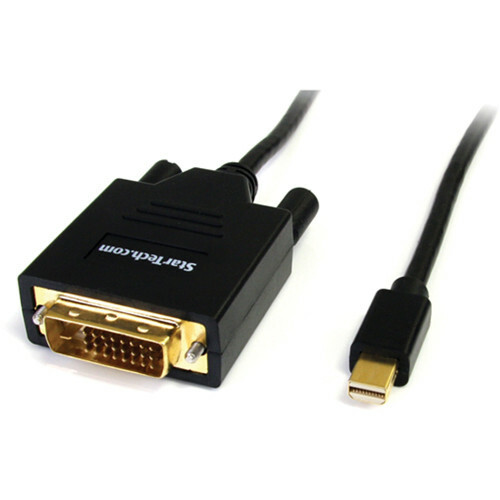 The 6', black Mini DisplayPort Male to DVI-D Male Cable from StarTech is a cost-effective Mini DisplayPort to DVI link to connect a DVI monitor to a PC or Mac with a Mini DisplayPort output. This way you save the expense of upgrading the monitor for compatibility. No additional converters or adapters, drivers or software installations required for this cable. The all-in-one cable design is easy to use and features optimal cable management. It is compatible with Intel Thunderbolt, when connected directly to a supporting DisplayPort over Thunderbolt I/O port. The cable supports resolutions up to 1920 x 1200 (PC) and 1080p (HDTV) for an optimal viewing experience. It is a passive adapter that requires a DP++ port (DisplayPort++), which essentially can pass DVI and HDMI signals also through the port. In addition the Cable provides easy and hassle free connection to your DVI display. Box Dimensions (LxWxH) 8.5 x 7.8 x 0.6"
Mini DisplayPort Male to DVI-D Male Cable (6', Black) is rated 5.0 out of 5 by 10. Rated 5 out of 5 by Luis from Great Cable My first time with a non-Apple cable. I wasn't convinced it this was the way to go, but fortunately I was proven wrong. Great cable, it does what it is supposed to do. Both ends of the cable fit the ports snuggly. I love the lenght of the cable; of course something we can get with Apple. I connect a MacBook Pro to a large monitor, now the heavy DVI cable isn't hanging off the tiny mini display port (something that happens with Apple). Rated 5 out of 5 by Armando M. from Very nice quality item Definitely would recommend. I needed a DVI to Thunderbolt adapter to connect a external display to my Macbook Pro. I had tried connecting it with a VGA to Thunderbolt adapter but the quality of the picture just wasn't what it should be. So I bought this adapter and the difference was night and day. Great quality and price. If you need a DVI to Thunderbolt adapter this is the one to get. Rated 5 out of 5 by peter l. from Al in one cable Mini Display-DVI-D This cable is superior to using an adaptor... Nothing to get loose, this all in one cable keeps things tidy. The connectors are not chincy... NO LOSS of signal quality. Rated 5 out of 5 by Ramsay from Works like a champ on my 2011 imac This works great, as advertised. I just plugged it in to the back of my imac and it worked perfectly out of the box. Would def. recommend. Rated 5 out of 5 by Rich from Works Great The cable performed as expected. It's great not having to use adapters and have one solidly built cable. Rated 5 out of 5 by Dobrin from Works prefectly I use this cable to connect a MacBook Pro to an old external monitor. Nothing to complain about! Rated 5 out of 5 by raz from quality cable No disappointments. The cable is just as I wanted and it performs well. Very good quality. Rated 5 out of 5 by ArJayGee from Does exactly as advertised Provides a seamless converter from DVI-D to Thunderbolt connection as found on newer Macs.